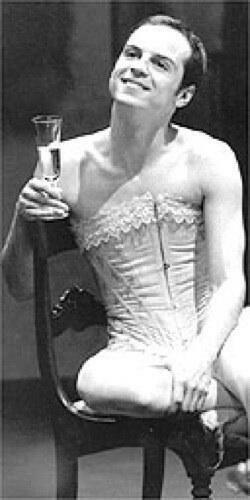 Naturally Andrew Scott playing Angel only serves to remind me of his brief scene from Tony Kushner’s Angels in America at the “National Theatre at 50” performance in October. In an evening full of highlights, this was a strong contender for the brightest moment of them all. I fervently wish for a full production and I fantasise about my perfect (british) cast: Andrew Scott as Prior, Tom Burke as Louis, David Tennant as Joe Pitt, Nancy Carroll as Harper Pitt, Simon Russell Beale as Roy Khon, Lennie James as Belize and Hattie Morahan as Ethel Rosenberg. It can happen, can’t it? This entry was posted in Fantasy Casts, Photo of the week and tagged Andrew Scott, Angels in America, Carrie Cracknell, David Tennant, Hattie Morahan, Lennie James, Nancy Carroll, Simon Russell Beale, Simon Stephens, Tom Burke. Bookmark the permalink.